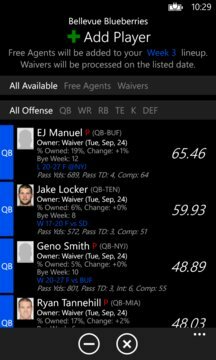 ***Top Rated Fantasy Football App for WP! *** Get your fantasy football teams from Yahoo! Fantasy Sports leagues right on your phone! Welcome to 2016! We're back for the new season, and excited to help you manage your fantasy teams! Last season you asked, and we heard you! StatGnome supports player transactions, including: Adds, Drops, Waivers, and even FAAB leagues. Just head to your Team page and tap the +/- icon. 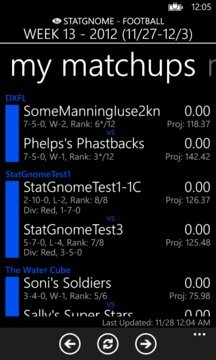 StatGnome remains the only Fantasy app for Yahoo with Live Tiles and Roster Alert Notifications! We know you want them! Heck, we want them too! Due to contractual restrictions with their stat projection provider, Yahoo! is currently unable to provide these in their fantasy data. We're looking into options, and hope to be able to provide these projections in a future update.